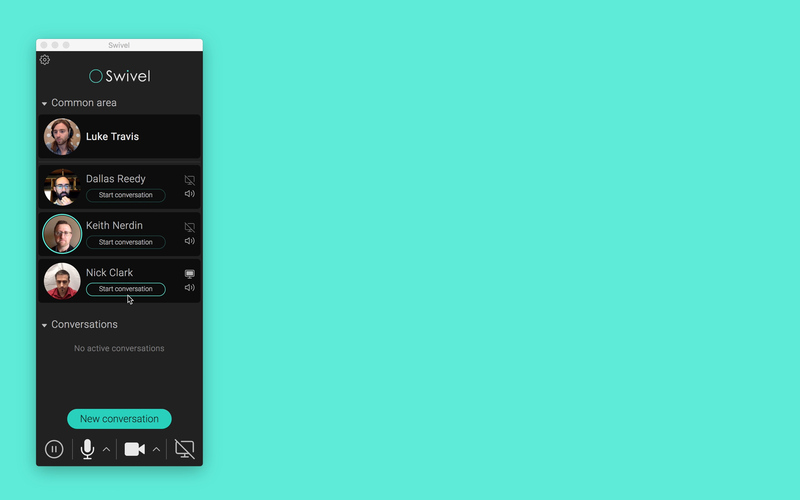 Swivel – Audio chat for remote teams with office-like acoustic interactions. Audio chat for remote teams with office-like acoustic interactions. We believe in living where you want, no matter where you work. Read more. 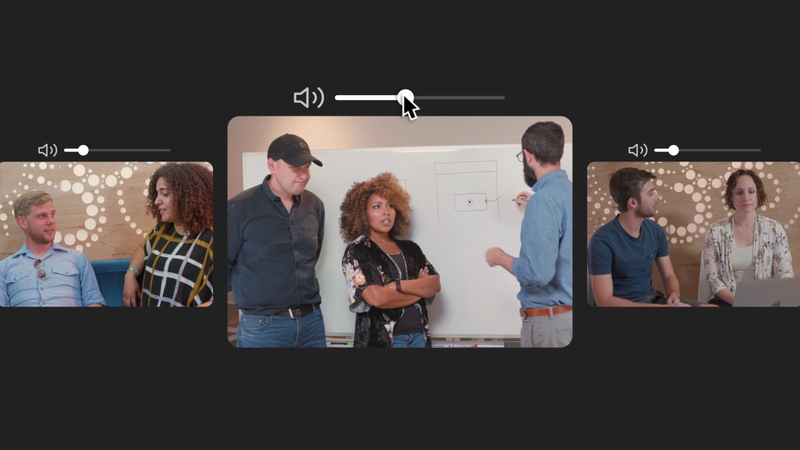 Swivel is an audio and screen-sharing tool that helps your remote team feel like you’re working together in the same room. Logging into Swivel each morning is like walking into the office, with multiple conversations unfolding simultaneously and everyone feeling like fully-integrated members of the team. Start the day by joining your team on Swivel—whether a meeting is scheduled or not. Get to know your teammates and stay in the loop with between-meeting conversations. Decide what to focus on by adjusting conversation volumes. Keep an ear out for your name, it can be a perfect opportunity to jump in and help a teammate out. Choose what’s most productive for you. Instantly start new conversations, join existing ones, or turn down the chatter for deep dives into challenging solo work. Hear multiple conversations at once. Organic conversations in shared physical spaces are extremely effective at keeping teams in sync. Officemates passively glean information from those around them, while comfortably participating in conversations when appropriate. These collaborative benefits have long been completely inaccessible to remote workers. Until now. Swivel is changing all that. In an open office, coworkers talk about all kinds of things; new clients, breakthroughs in challenges, ideas for projects, or even old hitchhiking stories. These are the sounds of work getting done and teams bonding. When working remotely with Swivel, you're no longer cut off from these interactions. If a conversation sounds interesting, simply click to join it. Enjoy the foundation of teamwork; hearing others and being heard. Talk to anyone with just a click. Simply bumping into someone at work dramatically increases the chances you'll finally share that thing you've been meaning to tell them. These "Oh, by the way" conversations often result in crucial insights or clearing pesky roadblocks. Text chat and team meetings don't provide this same trigger effect, but Swivel does. Being a click away from instantly talking to anyone on your team is as easy as it gets. Pause work when life happens. When the realities of remote work strike – the dog barks, your spouse walks in, your kids arrive home from school, or you just really need to heed the call of nature – simply push the pause button. All incoming and outgoing media streams turn off instantly. 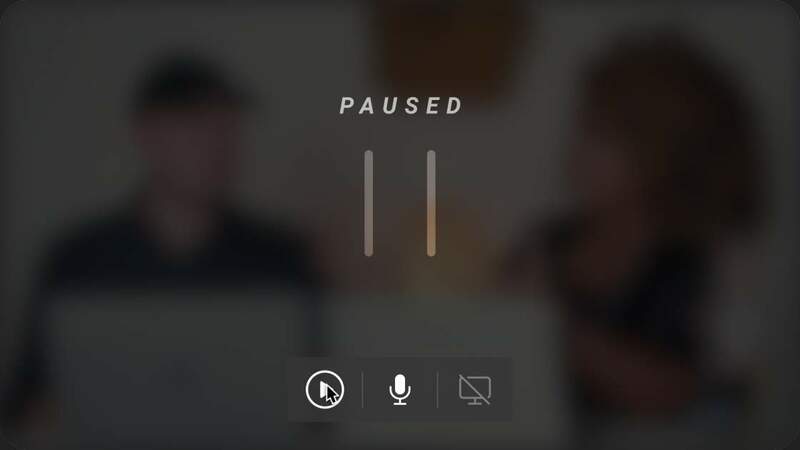 Your team can easily see you're paused, and when you're done, just click play and you'll be right back to work. Why yet another video, audio, and screen-sharing tool? When our remote team would work together in a shared office, our collaboration and sense of camaraderie would skyrocket. We used Slack for asynchronous communication, but we felt like something was still missing. We tried stand-ups & pairing sessions in Zoom. 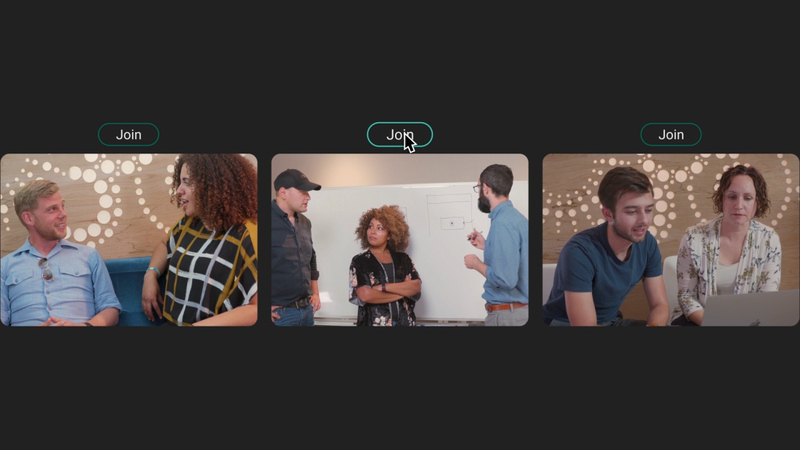 We tried Slack’s video calls. We even set up our own Discord server for a few weeks, and that’s when it hit us: we were missing the sights & sounds of a shared office. We were missing serendipitous interactions like hearing our names mentioned from across the room or joining impromptu conversations. 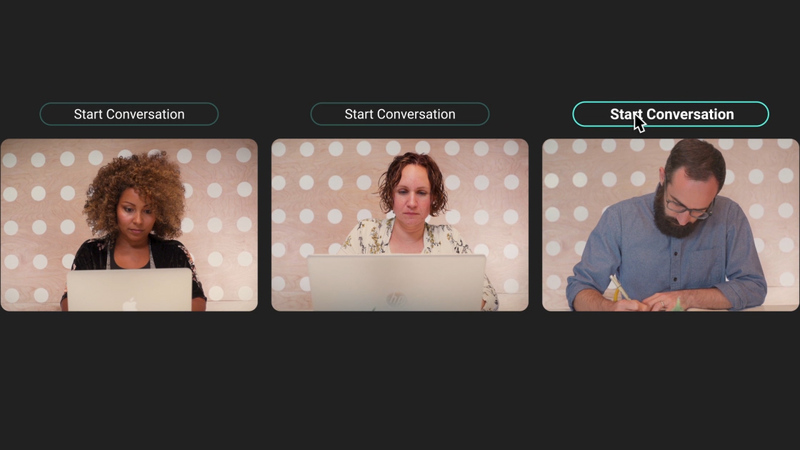 So we took all we learned from using tools like Google Hangouts, GoToMeeting, Talky.io, and Appear.in, and we began the long and arduous process of creating a tool of our own, one where remote teams could finally collaborate like they were working in the same room. We believe in choosing where you live, no matter where you work. The best employees are happy employees. And the happiest employees are those who get to do work they love, with teams they love, in the places they love. We believe everyone deserves to be heard and understood. We believe the need to be heard and understood is a core characteristic of being human. Unconditional, skillful listening is a precious gift always worth giving. We believe good conversations create a sense of belonging. Society is more connected than ever, and yet more isolated than ever. Real conversations have the power to break through walls of isolation. A real mountain biker & a virtual pilot who dreams of flying (real planes) around the country while working remotely. A dog-whisperer extraordinaire & escape room puzzle designer who never shies away from a challenge to a battle of puns. An aeroplane pilot and green smoothie enthusiast who prefers dirt roads to pavement. Meet the team behind Swivel. A believer in community & co-working who chews more gum each year than most people do in a lifetime.